It’s been quite a while since we updated our latest news section. Alot has been happening since we returned from our recent trips in West Africa so here we go. 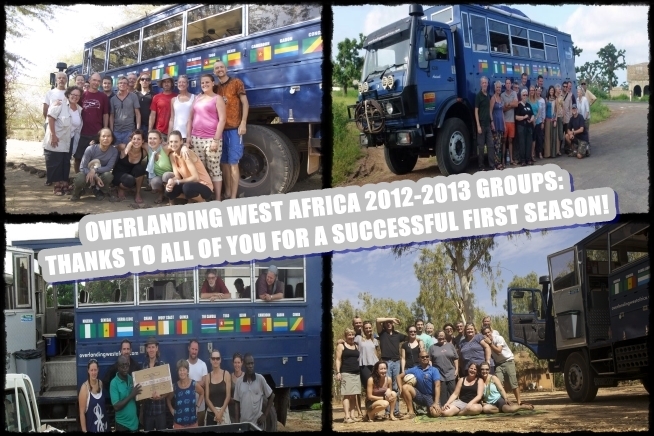 Firstly, we want to say a massive thank you to everybody who had the confidence to book with us for our first season through West Africa in 2012-2013. We couldn’t have run these trips without you! 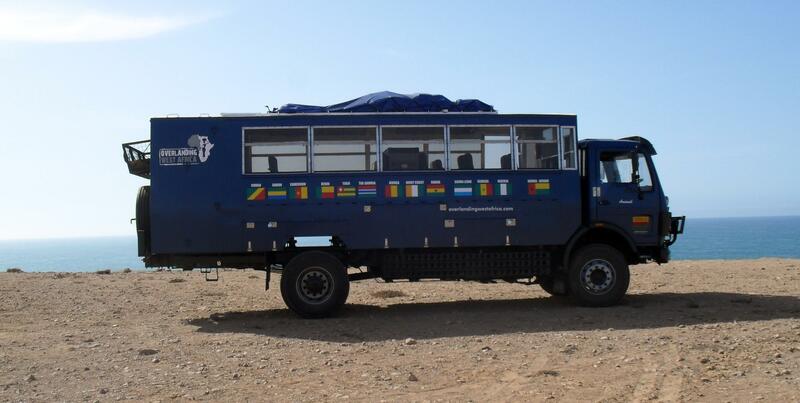 We took a gamble by devising, marketing, selling, and operating a trip which no overland operator had done before, connecting Senegal to Ghana via the coastal countries of Guinea Bissau, Guinea, and Sierra Leone. We also travelled through Senegal’s Casamance region, which has not been done for several decades by an overland truck based operator, and Ivory Coast which has effectively been closed to overlanders for the last 10 years. We were the first to run trips into Guinea Bissau and Sierra Leone, something we are very proud of! 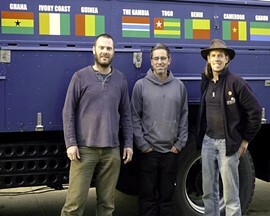 After finishing the trips in Dakar in mid-April 2013, Jimmy and Hatter drove back to the UK. It took just over 2 weeks so we were both pretty tired when we got back to UK. The journey home took us through Mauritania and Western Sahara, a sparsely populated area with some of the most beautiful coastline anywhere in the world. Here is a shot of Aminah where the Sahara desert meets the Atlantic ocean. On returning to the UK, we met Al who has decided to join the OWA team as director. Al is an experienced overland trip leader and a fellow West Africa aficionado. We’re both very pleased to have Al onboard. Al will be leading the 2013-2104 trips. Read more about the new OWA team by visiting our Who We Are page. Looking ahead now to 2013-2014, we have decided to include Liberia in the itineraries for our Freetown To Accra and Accra To Freetown trips. We will be the first commercial truck based overland company to devise, market, sell, and operate a trip through the country, something we are all very excited about. Liberia has only opened up to tourism in the past few years and with the British Foreign Office lifting the travel advice we are very pleased to be able to include it in our itineraries. We have also been busy with our web designer changing a few things on this website. We now have a sliding image gallery at the top of each page, showing off some of the best photos taken by us and the passengers on our recent trips. We have a new social media click through bar at the top right of each page, which will take you to our popular Facebook, Twitter, and You Tube Channels, as well as one for Pinterest. We have some incredible shots on Pinterest do click through and have a browse to whet your appetite for West Africa travel! In addition, we have a new box on the right hand side of each page below the latest news section called ‘Photo Gallery’. Al has been very busy adding some of the best images from the trips we have just run. It’s an incredible selection showing off the beauty of the people and landscapes of the region. There is also a new “OWA Trip Videos” tab on the right hand side of each page. Click on any of the videos shown, enlarge the screen, and sit back and imagine yourself on one of our trips in West Africa! We would like to say a huge thank you (in no particular order) to Holly Melanson, Ian Grieve, Sally Crace, Wilna Wilkinson, Ant Marcon, Will Betts, Rob Kuhlman, Di Forgan, Inga Lotta, Simon Ottner, Annie Porter, Jemma Dunn, Clare Glade Wright, Scott Carlyle, and Sally Holbrook, for allowing us to use some of their photos for promotional purposes, thanks so much guys! You can see a photo of some of the passengers who joined us on the trips lower down this page. We would also like to say an extra special thank you to Jamie Noel, who joined us on our Accra To Freetown trip. Jamie is a professional film maker and made a number of short films about the trip. Highlighting the people, culture, music, landscapes, and trip life in general, the films offer a fantastic insight into the region and are accompanied by superb soundtracks. Thanks so much Jamie! You can watch Jamies videos below, and will find them elsewhere on this website. Below is a photo collage of some of the passengers who joined us on Aminah for our 2012-2013 trips. We are looking forward to meeting everybody booked onto our next set of trips starting in late October this year (once rainy season has thrown the worst it can down and the region is drying out). Remember, we still have a few seats left on all of our 2013-2014 departures, and are offering discounts if you book two trips with us. There never has been a better time to visit the region. Not sure yet if you should come along for the adventure? Read some Passenger Feedback about us and the trips we run to find out more, and read our Why Travel With OWA? page to see what makes ours trips so much better than others out there! THANKS TO ALL FOR AN INCREDIBLE FIRST SEASON!